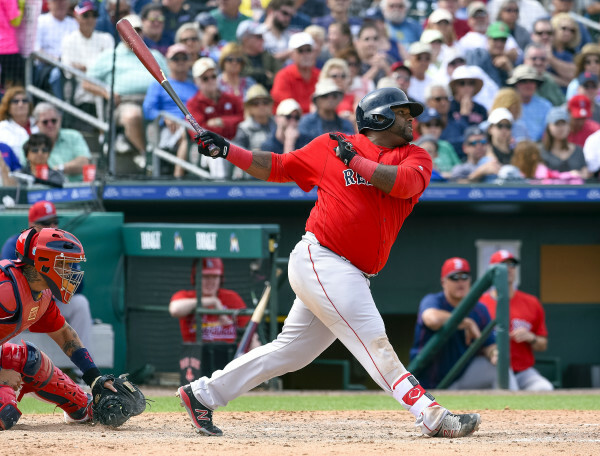 Boston Red Sox third baseman Pablo Sandoval connects for an RBI base hit against the St. Louis Cardinals during a game on March 21 at Roger Dean Stadium in Jupiter, Florida. Boston Red Sox infielder Travis Shaw throws to first base in the third inning of a spring training game March 11 against the Toronto Blue Jays at Florida Auto Exchange Park in Dunedin, Florida. Travis Shaw unseated $17 million third baseman Pablo Sandoval to win the starting job for the Boston Red Sox coming out of spring training. “For right now to start the season this is what’s best for our team,” manager John Farrell said of the decision Thursday. Farrell said salary is not his concern when determining the best lineup for the Red Sox. Shaw’s 2016 salary is the league minimum of $520,000. Shaw, 25, has better range, Farrell repeated Thursday after meeting with both players. Increasing range isn’t simple, third-base coach Brian Butterfield explained. Sandoval, an eight-year veteran, signed as a big-ticket free agent before last season. He’ll be on the bench for opening day with outfielder Rusney Castillo, who was signed in 2014 out of Cuba and given a $72.5 million contract. Shaw played in 47 of the final 48 games for the Red Sox under interim manager Torey Lovullo and got off to a brilliant start at the plate this spring. The quality of his at-bats and avoiding strikeouts are credits to Shaw, whom teammates say carries himself like a 10-year veteran. He broke in last August, smacking a pair of home runs in a game twice in a two-week span that month. With his strong throwing arm, defense has always been a plus for Shaw. When and where the Red Sox work Sandoval into the lineup is to be determined. Hanley Ramirez will play more first base and David Ortiz owns the designated hitter role. All Sandoval can do now is be ready. The Red Sox open Monday afternoon against the Indians in Cleveland.